This is my personal favorite starter. Stronger than any standard starter. I urge you to order the silicon insert as the one that comes with the starter is a bit hard. Specifications below are those of the manufacturer. Smaller and lighter than conventional starters. Easily starts .60 (10 cm?) 2-Stroke or .90 (15 cm?) 4-Stroke engines. Size: approx. 6.3 x 1.8 in. (160 X 45 mm), 12 - 14.4 v. operation. 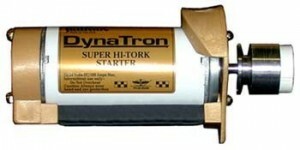 Every RC modeler knows about The Dynatron starter. It is considered a field essential by most and instantly tames stubborn engines into submission with its amazing starting power. The most powerful Sullivan 2.50" starter. Features a machined aluminum drive cone with pulley groove, 2.50" diameter steel body and gold end caps. 12 or 24 VDC operation, maximum 80 amps. 340 in-oz (240 N-cm) of stall torque at 12V, 680 in-oz (480 N-cm) at 24V. 4800 no load RPM at 12V, 9600 no load RPM at 24V. For most engines up to 2.4 cubic inches (40 cc). Also available; 3" gold aluminum nose cone (#S630) which threads directly onto Dynatron shaft. Dave's Notes: Well known to be the strongest direct drive starter of this diameter. Originally designed to hold a 10 cell NiCad battery. Much safer to run a starter without a cord running back to your power panel or battery. Nothing to get tangled up. 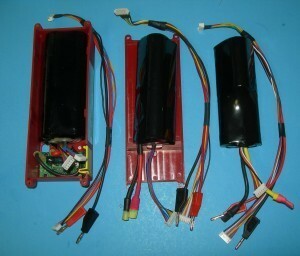 Holder has room for up to 2 3200 3S Lipo Battery packs. A single pack is perfect for every a couple days of hard flying. Dual packs have more capacity than a standard field box gel battery. Eliminate weight in your field box by using your new 6400mah (6.4 amp hour) starter battery as your pump, charger and glow driver power source. Battery pack options available in drop down boxes below. Standard Tamiya connectors included. We suggest upgrading to Deans Ultra to go between your battery and starter. If your getting the dual battery setup, you will also need to fabricate or purchase a Parallel Deans Y harness. These items are available in the Drop Downs below. 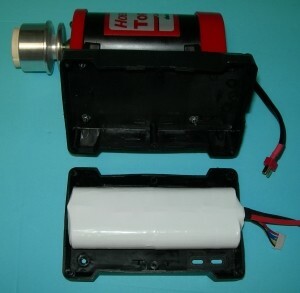 Heavy duty long life 12v starter. Comes with reversable starter driver for both spinners and direct against prop. Wires come bare and rady for included gators for direct connection to battery. You may also provide your own bananas and drive from a power panel. Dave's Comments: Costs more but it's well worth it in my view. Of all the direct drive normal sized starters, this is absolutely my favorite. The Hobbico Power Core is a nice battery holder, the only problem is it comes with a small weakish lead acid battery inside. The voltage depression of this small battery is very large resulting in a weak performance from your starter. Running a 4S A123/LithiumWerks will just about double the torque you have now. The nominal voltage of a 4S LIFE pack is 13.2v. And, It''s voltage won''t depress nearly as much when your squeeze the trigger delivering more torque than ever before. Note, you must install a connector on your starter wire up to the task. Suggested connectors are listed below. If you order a "Set for Starter Wire", you''ll get a complete set of plugs. The one you don''t put on the starter wire can go on the battery if you wish to install it yourself. If so, sellect "None" for Output Connector. If you select an output connector, we''ll put it on the pack for you ready to go. You''ll still need to install a plug on your starter wire to match. Fits Sullivan Standard, Deluxe or Dynatron starters. Made to drive bare props without spinners. Molded in bumpers drive on the edge of the blade. Made for standard rotation only, not for counter rotation engines. Fits Sullivan, Standard, Deluxe or Dynatron starters. Made for long spinners and has excellent grip, and excellent life. White silicone. Silicone starter cone. Standard Diameter. Grips spinners better than rubber cones, less marring of plastic spinner. 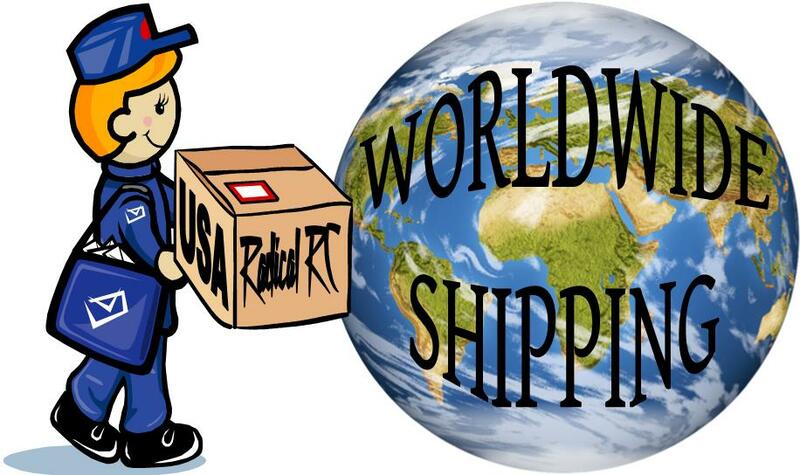 Fits most starters such as Sullivan Standard, Deluxe & Dynatron. (will not fit Kavan). 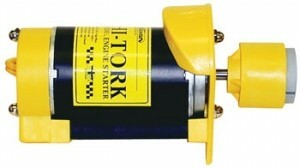 Fits Sullivan Standard, Deluxe or Dynatron starters. Made for long spinners and has excellent grip, and excellent life. Blue silicone.